Margaret K. McElderry Books, 9780689855122, 40pp. 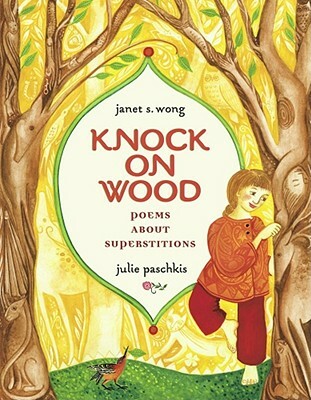 In this collection of original poems, accomplished poet Janet S. Wong explores seventeen superstitions, some common, others that are less known, and delves into their origins as well as their lore. Rich, full-color illustrations by Julie Paschkis enhance each poem. The result from this award-winning team is sure to intrigue young readers and make them think again about things they often do, like opening an umbrella, walking under a ladder, or putting on a hat! Janet S. Wong is the author of more than a dozen picture books and poetry collections. Her work includes Night Garden: Poems from the World of Dreams, a New York Times Best Illustrated Book, and Knock on Wood: Poems About Superstitions, both illustrated by Julie Paschkis, as well as Grump, a Charlotte Zolotow Award Highly Commended Book, illustrated by John Wallace. Janet lives with her family in Medina, Washington.